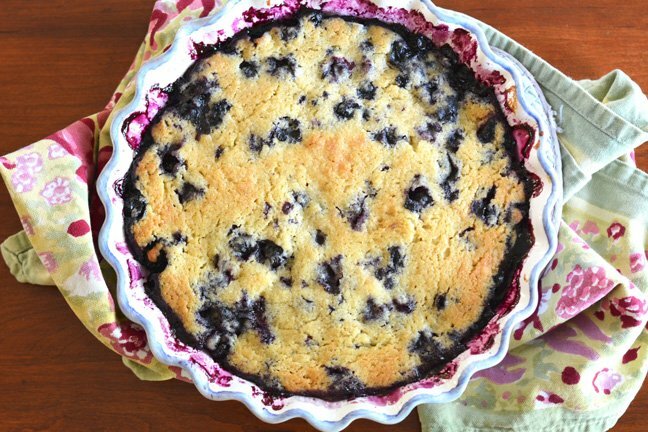 Blueberry desserts are some of my favorites, and this is the season to make them. The flavor of blueberries is always delicious, but sometimes I like to add a little “pop” to my blueberry desserts with some fresh spices or zest. Last week I made this blueberry cobbler and added a tiny bit of chopped candied ginger and some lemon zest. It added some zing and a tart element to the very sweet berries. I love how the flavors were surprising without overwhelming the blueberries completely. It was a hit on our picnic, and it’s something I’ll definitely be making again this year, especially as the weather turns cooler in a few weeks. Step 1: Preheat the oven to 375 degrees F. Spray an 8-inch square pan with baking spray. Step 2: In a large bowl toss the blueberries, lemon zest, ginger, and ½ cup of sugar. Spread it into the baking pan so it is all even. Step 3: In the bowl of a food processor combine the flour, baking powder, salt, and remaining sugar and pulse until small pebbles form. Then add the egg and vanilla and pulse again until a dough forms. Step 4: Drop this mixture on top of the fruit so it is mostly evenly covered. Bake the cobbler for about 30 to 35 minutes, or until lightly brown and bubbly. Serve warm with vanilla ice cream.